Every variation on extreme human behavior could be seen between 1939 and 1945: the Nazi wolf savaged Europe, while Tojo’s Japan sought to found an empire on bloodstained ground. The eventual Allied victory over the Axis called for commensurate extremes of determination, sacrifice, and judicious ferocity. People an ocean away from the front lines wept and exalted over the uncertainties, losses, and successes of their cause. No news source brought the daily progress of World War II to Americans like the New York Times. This deck of Knowledge Cards addresses 48 major wartime events in quiz form: each card features a partial headline (e.g., Chamberlain Resigns, ? Premier). The answer and an excerpt from the attending article appear on the opposite side. 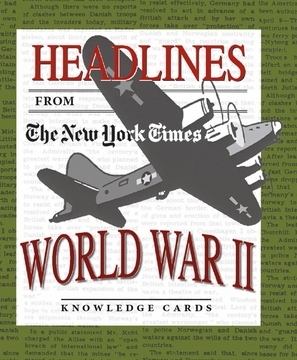 These cards offer fascinating contemporary coverage of a twentieth-century cataclysm, presented with the Times’s characteristic accuracy and intelligence.